So it's finally my turn to host a dinner for the MNSC boys. It's been a long time since any of us last hosted a dinner at Caprice, but I knew Hairy Legs would not fail me. 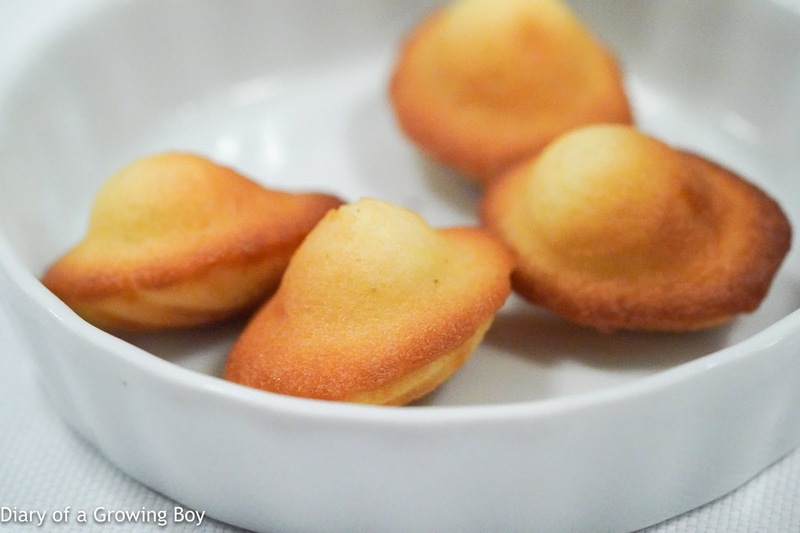 Knowing this was a big thing for me, Hairy Legs, sommelier Victor Petiot, and I had a gathering last week to discuss the dishes that would pair with the wines. I asked for a short menu since some of the boys have been cutting down on the amount of food they take in, and Hairy Legs decided to put together a few dishes with plenty of truffles. 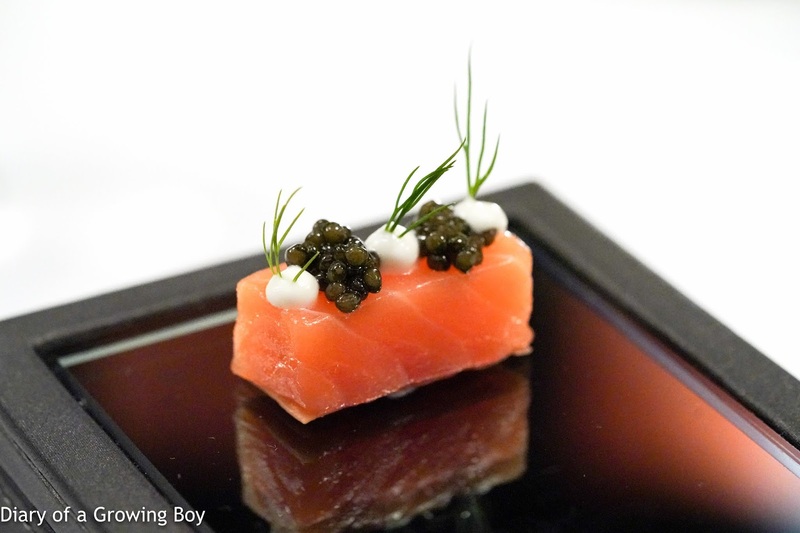 Balik salmon with crème fraîche and oscietra caviar - pretty smoky. 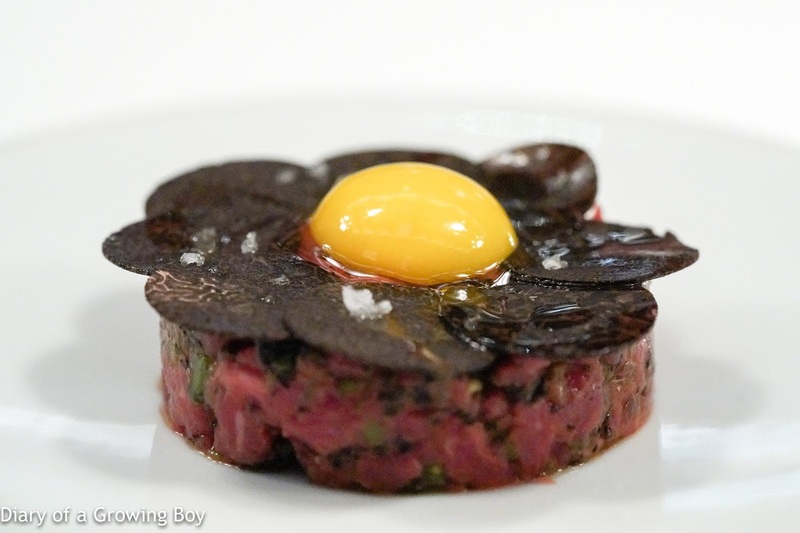 Tartare de bœuf, truffe noire et œuf de caille - with Australian wagyu as well as Tasmanian black truffle, and a quail egg on top. This was very tasty, with crispy diced chives as well as diced truffle mixed in with the beef. 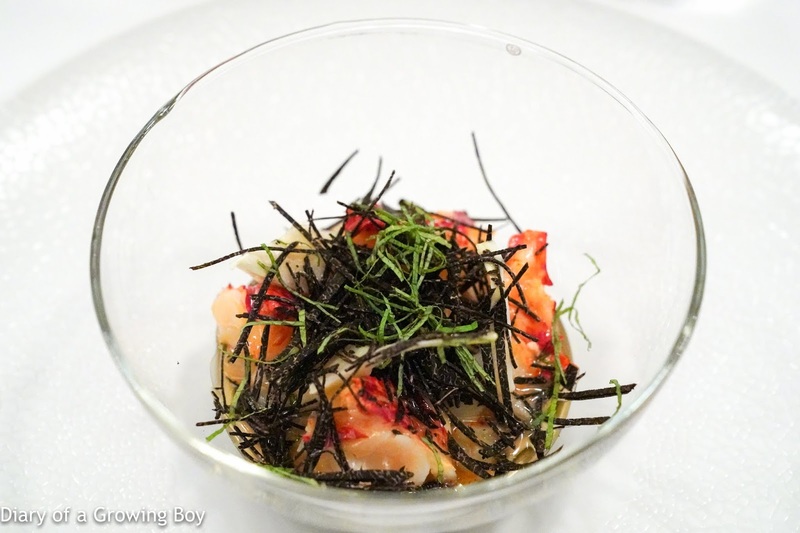 Homard bleu de Bretagne, artichaut, duxelle, menthe et truffe noire - with artichoke mash, mushroom and fennel duxelles, chicken jus, and a mix of Tasmanian black truffle and mint. This was very, very good. 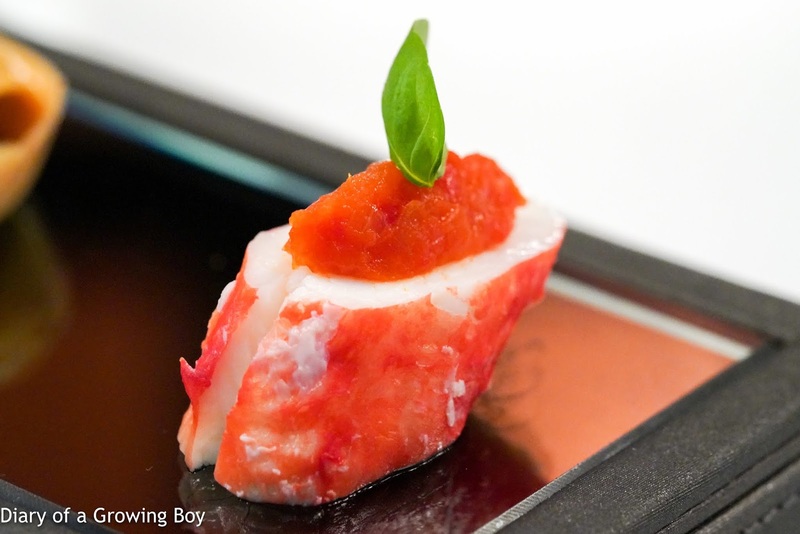 Most of us were surprised at how well the mint just seemed to perk things up in this dish. 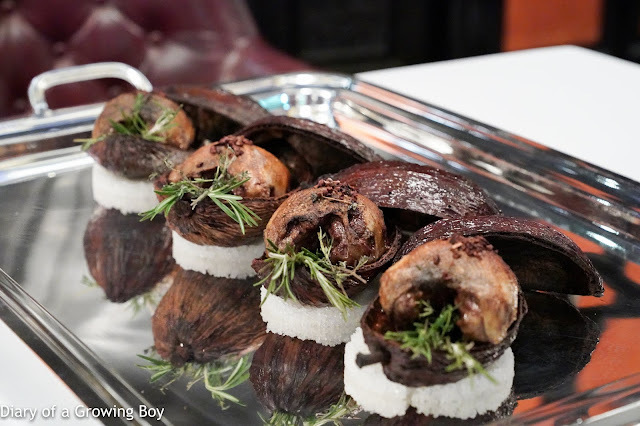 Another of Hairy Legs' signature dishes... with pigeon being done in cocoa pods. 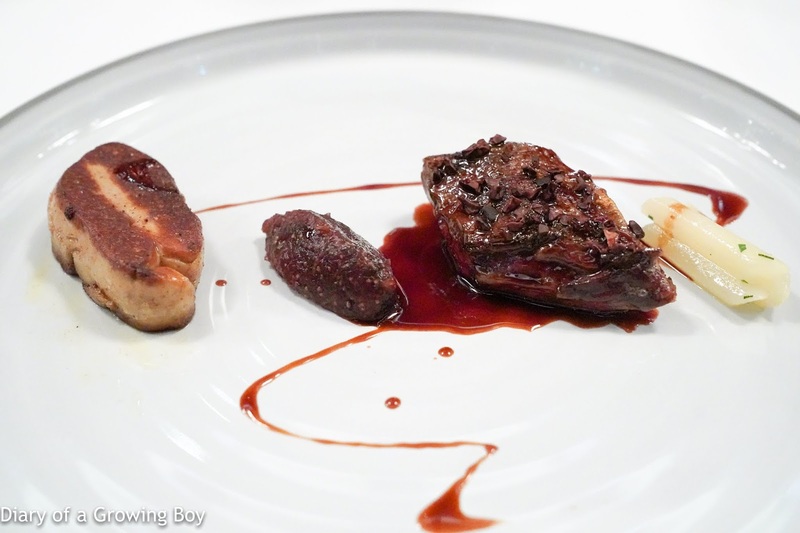 Le pigeon de Racan de la Maison Bellorr, cuit dans une cabosse de cacao, chutney de figues et salsifi - the pan-seared foie gras on the side was very, very good... wonderfully soft and wobbly texture. The fig chutney worked very well with the pigeon. And the pigeon itself was perfectly rosé, exactly the way I would want it. 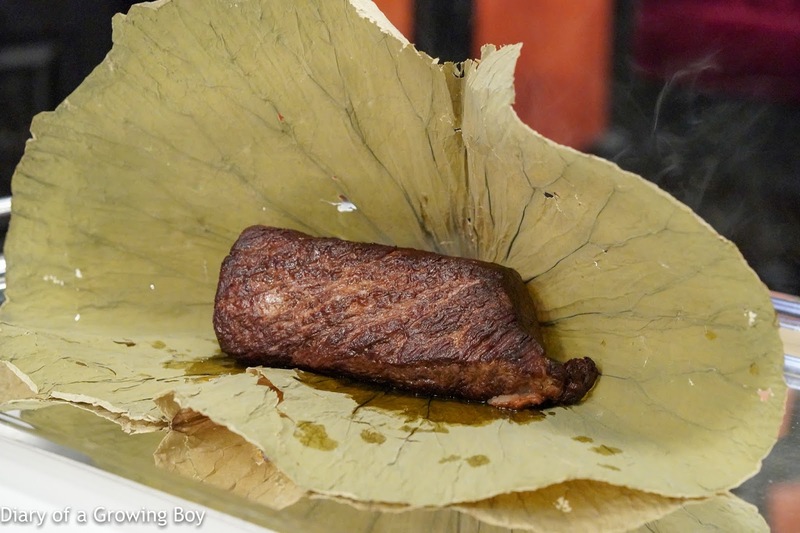 I've seen this presentation of beef in a lotus leaf before... which had been smoked with Japanese cherry wood. 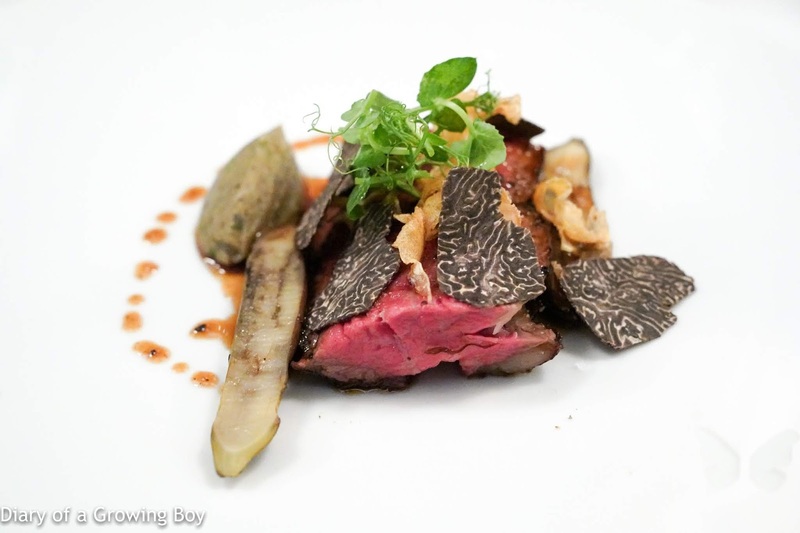 Faux filet de bœuf Kagoshima et aubergine, sauce Périgourdine - with pickled eggplant, eggplant caviar, artichoke chips, and black truffle on top. Very, very good. Just look at the color of the beef! Soooo tender. 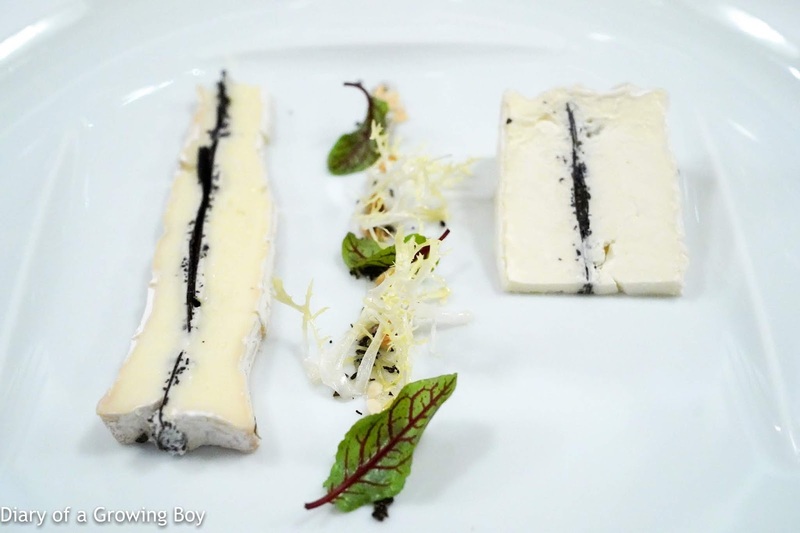 Brillat-Savarin et Brie à la truffe noire, pain au noix - the kitchen made their own truffled cheese just for us, aging it for 2 days to ensure the truffle flavors got into the cheese. 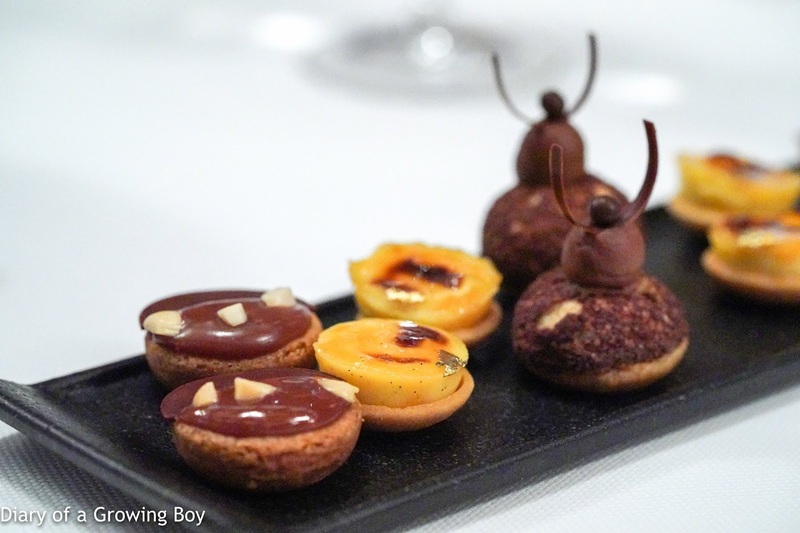 Mignardises - packed home for the boys' better halves. A few of the boys had stopped coming to Caprice for the last few years, and they were honestly surprised by the dishes tonight. 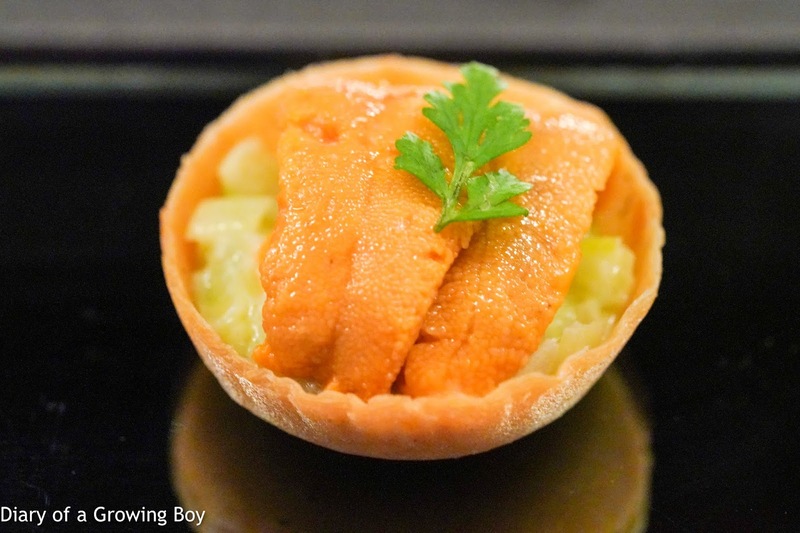 Everyone was very, very happy with how well the dishes worked with the wines. And speaking of the wines... I had been wanting to do a vertical tasting of my favorite wines from my favorite producer for a long time. Tonight was that opportunity. I left the treatment decisions entirely up to sommelier Victor Petiot, and the results were a little surprising to many. 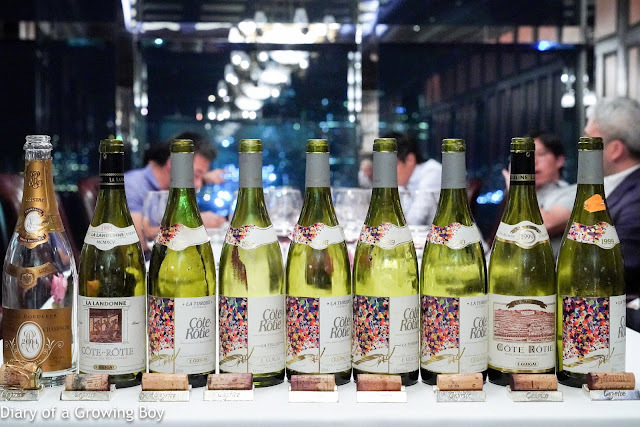 As it turns out, most of the wines still tasted as if they were very young wines - even the bottle that was more than 30 years' old. 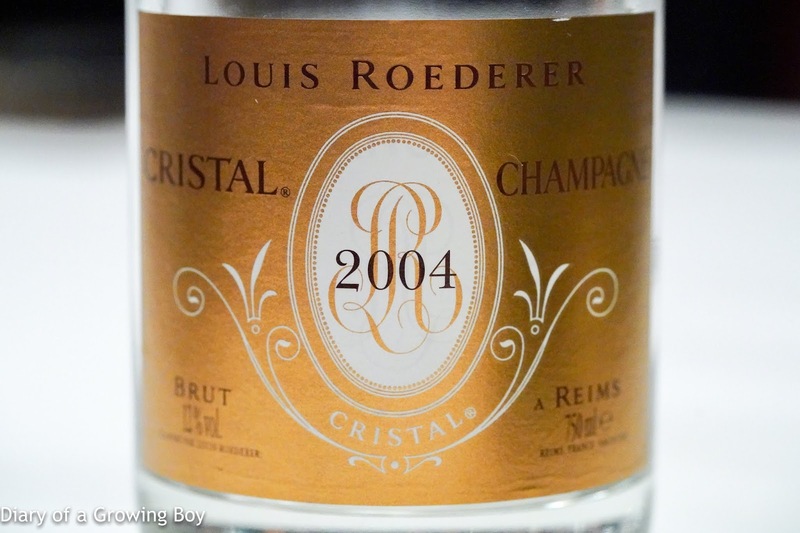 2004 Louis Roederer Cristal - very nice and floral. Nice and balanced on the palate between crisp acidity and some ripeness. First pair: opened 6 hours and 15 minutes prior to serving. Not decanted. 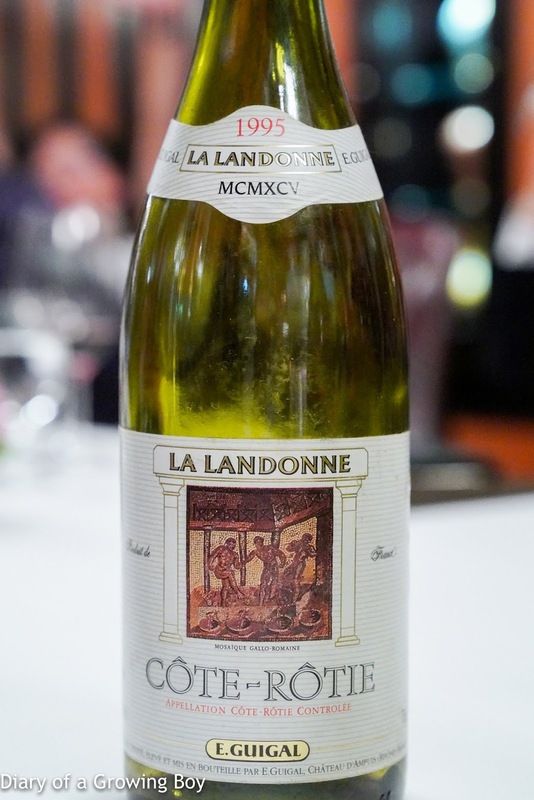 1995 Guigal La Landonne - minty, eucalyptus, a little sweet with black fruits, a little smoke. 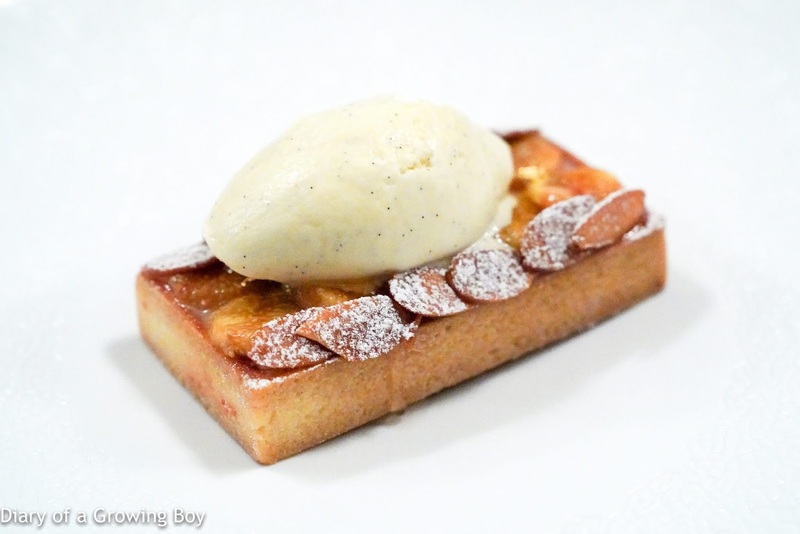 Good acidity and slightly lighter on the palate, with a little bacon fat. 96 points. 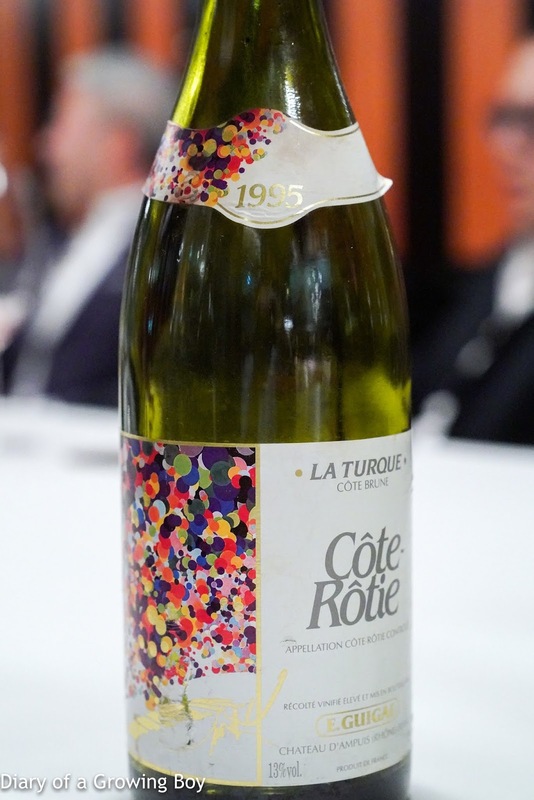 1995 Guigal La Turque - smoky, leather, a little shoe polish? Still full-bodied. 95 points. 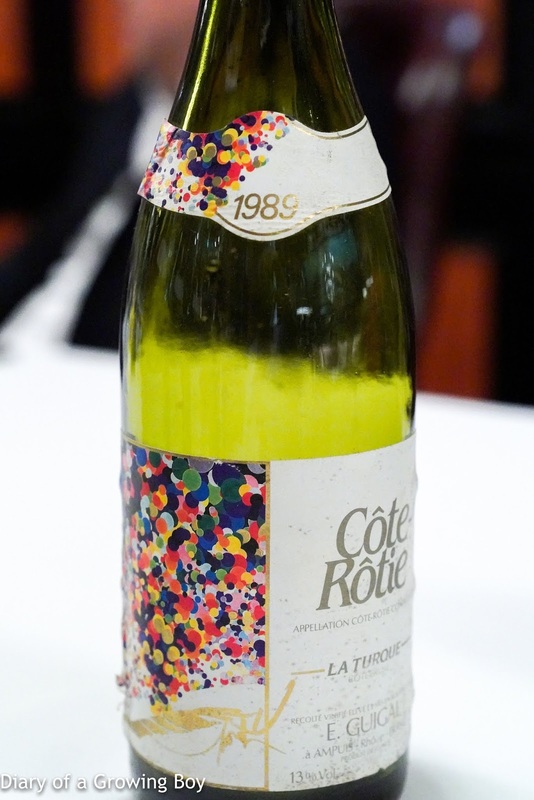 1985 Guigal La Turque - opened 7 hours prior to serving. Very meaty and smoky, a little savory, and a little coffee. 96 points. 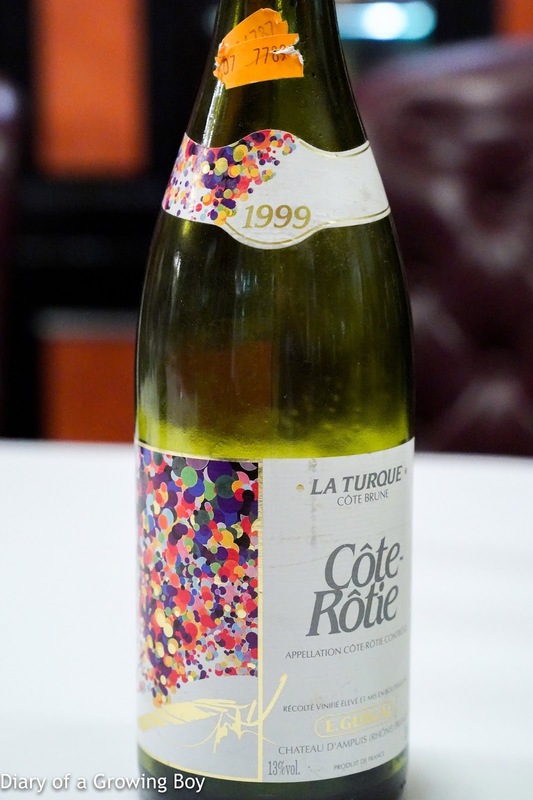 1998 Guigal La Turque - opened 7 hours prior and decanted 1 hour prior to serving. Notes of pencil lead, with nice and ripe sweet fruit. 95 points. Third pair: opened almost 8 hours prior to serving. 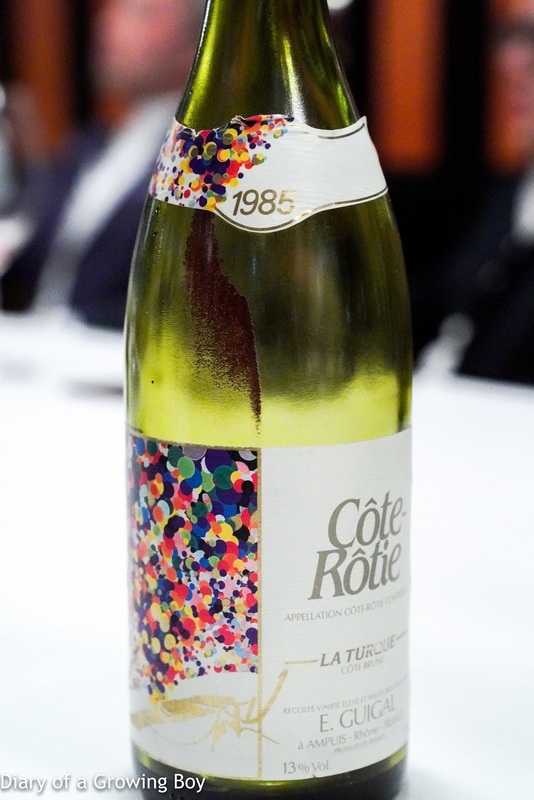 1989 Guigal La Turque - nice bacon fat, coffee, smoke. Very nice. 99 points. 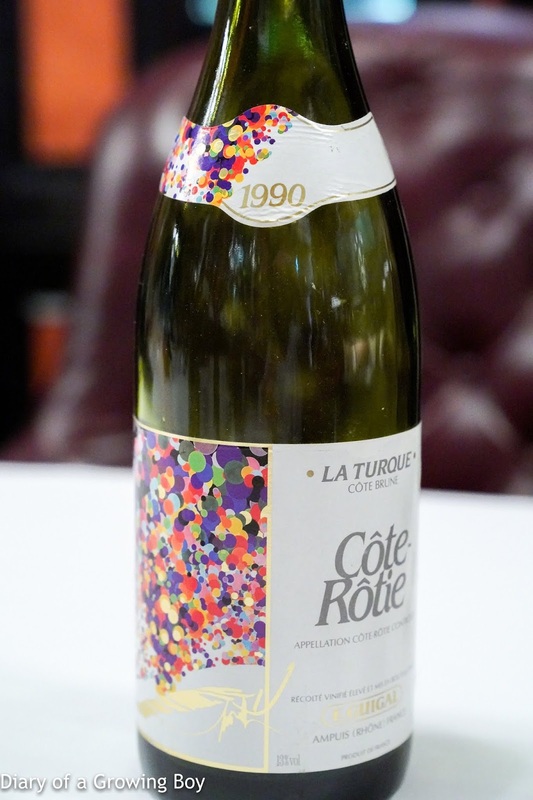 1990 Guigal La Turque - more closed, ripe and stewed fruit, grilled meats, a little savory but not quite black olive. 96 points. 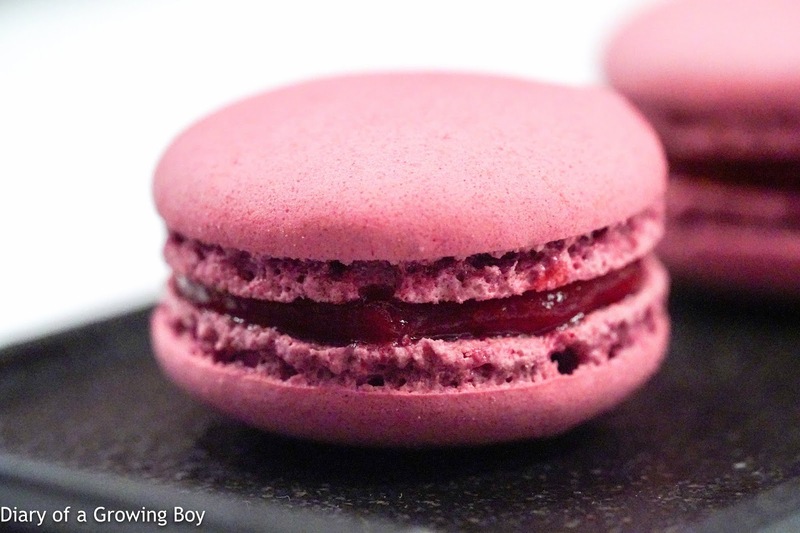 Fourth pair: opened 8 hours and 40 minutes prior, and decanted 2 hours and 40 minutes prior to serving. 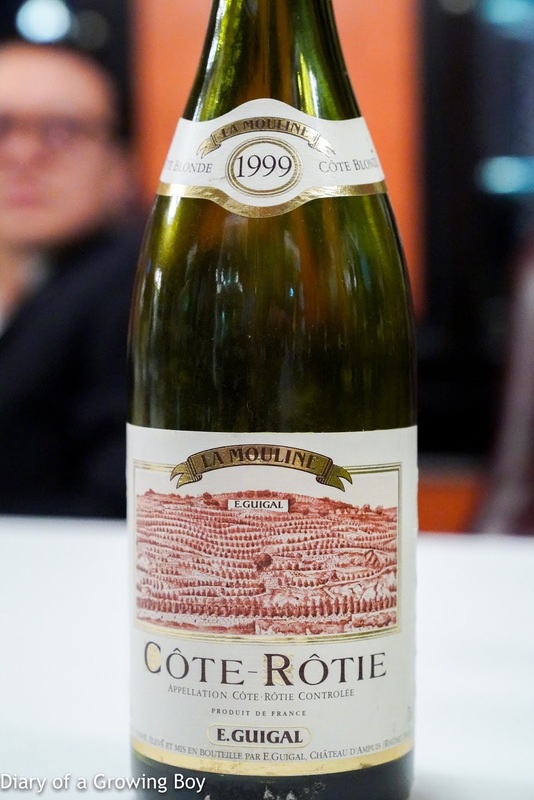 1999 Guigal La Mouline - minty with grilled meats. 96 points. 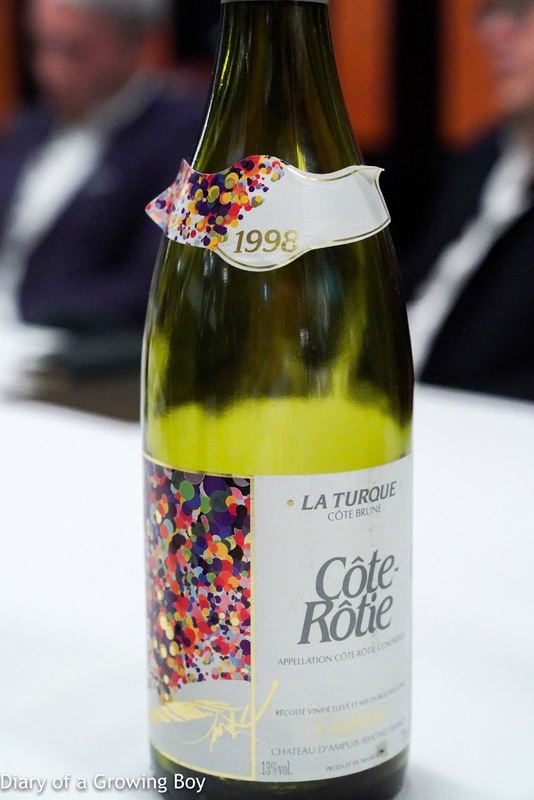 1999 Guigal La Turque - still concentrated, with sharp alcohol, still smoky, oaky, ripe and sweet on the palate. 96 points. I loved lining up the bottles tonight for a "group shot", as I had been cellaring all of these bottles for at least a decade. Many thanks to Hairy Legs, Victor, and Ken for taking such good care of us tonight.